Book Jacket: "Sara is sixteen and pregnant. Her once-devoted boyfriend seems to have disappeared, and her only option appears to be an open adoption with George and Eva, an older couple desperate for a child. But after the birth it's clear Sara has a bond with the child that Eva can't duplicate. And when Sara can't let go, Eva and George make a drastic decision with devastating consequences for all of them." Taryn's Review: This is one of those books where the cover drew me in. The gorgeous bokeh created a beautiful, lit swirl of green that immediately attracted me to it and I loved the young girl balancing on the wooden beam. This was my first reading of a Caroline Leavitt work and I have to say, I am a big fan of her writing skills. 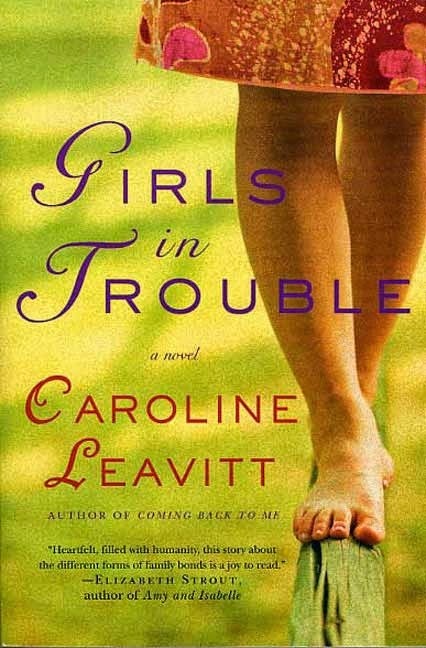 The book's characters all felt so real and my emotions shifted from character to character as Leavitt's words breathed life into their actions and thoughts. The situation was supposed to be a happy one for all with the adoption of a child under the banner of openness, but all goes awry once the birth mother, Sara, has second thoughts. While anyone could sympathize with Sara and her situation, her later accusations made her sound a bit delusional at times. I did question why Eva and George, the adoptive parents, would still be kind to Sara after she accused them of stealing her daughter, even though Sara had signed the paperwork giving up all rights to the child. The birth father was not part of the scene and while there was some sketchy stuff surrounding the termination of his rights, it would have happened eventually. Sara's behavior was so very selfish that I wished someone would put her in her place, but Eva and George did not. I also felt like Sara's/George and Eva's daughter Anne turned her back fairly quickly on her adopted parents once she found out the truth. I mean, we've all been 16 before and dealt with the crazy hormones that cause us to battle with our parents, but Anne, it seemed, was totally willing to abandon her known parents without real cause. It was a bit unsettling. By the end of the book, I really wasn't a fan of Sara (especially after she and the birth father, Danny, were reunited). She often seemed to not want what was best for Anne, but for Sara herself, and she hurt a lot of people in the process of that want. The book ended happily enough, but it left me feeling really ragey at Sara; George and Eva had been so very supportive and loving toward her, in the past and even years later, when Sara certainly didn't deserve it, especially since she never apologized or seemed remorseful for something terrible she had done to George and Eva. I really think Leavitt is a great writer and I found this book to be really engaging. I flew through it and looked forward to reading it nightly. I often didn't know what turns and twists were on the horizon, which is always a treat for me. Although this story wasn't my favorite, it caused some emotions in me and made me think. I definitely look forward to reading another work by Leavitt!